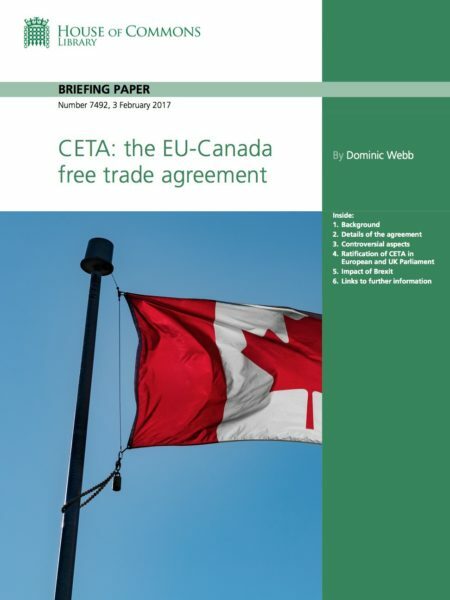 The Comprehensive Economic and Trade Agreement (CETA) is a free trade agreement between the EU and Canada. The CETA talks started in 2009 and were completed in 2014. The agreement was signed on 30 October 2016. Signing of the agreement was delayed by a few days due to objections from the Walloon Parliament. Signature of the agreement does not mean it comes into force immediately. The next step is consideration of the agreement by the European Parliament. Provided the European Parliament gives its consent, much (but not all) of CETA may come into force provisionally. CETA could come into force provisionally in Spring 2017. CETA removes all tariffs on industrial products traded between the EU and Canada. Most will be removed when the agreement comes into force. All will be removed within seven years. There is substantial liberalisation of trade in agricultural products. EU businesses will be allowed to bid for public procurement contracts in Canada. The European Commission has put CETA forward as a “mixed agreement” while maintaining its strict legal view that CETA is an “EU-only” agreement. As a mixed agreement, CETA must be ratified by each EU Member State and must receive the European Parliament’s consent. In the UK, the agreement must be laid before Parliament for a period of 21 sitting days. The agreement can only be ratified if the 21 day period has passed without either House having resolved that it should not be ratified. In the event of such a resolution by the Commons, a further period of 21 days is triggered during which the Commons can again raise objections. The European Scrutiny Committee has recommended that there be a debate on CETA on the Floor of the House of Commons. CETA will be debated in European Committee B on Monday 6 February 2017. The House of Commons International Trade Committee has also started an inquiry into CETA.